Dr. Vicente E. Ruiz is Head of Training and Research of the Modular Service Coordination for National Medical Center in Mexico where he specializes in prevention: obesity, diabetes, hypertension, ischemic cardiac disease, valvular cardiac disease, pulmonary hypertension, heart failure, arrhythmia, and more. He is Staff Cardiologist at the Hospital San Angel Inn University, and Coordinator of the Heart Failure Clinic and pulmonary arterial hypertension clinic of the National Medical Center. 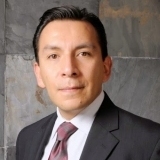 Dr. Ruiz is a trained surgeon from the the Faculty of Medicine of the UNAM Cardiology in 1997. He speaks at the National Cardiology Seminars in Mexico City. In his free time, he enjoys traveling, reading, running, cycling, and swimming.